Treks vary from short three-day walks across low altitudes to the three-week Snowman Trek that covers 356 kilometres and climbs three of the Kingdom’s highest passes. Not only the overall duration but also the daily walking distances vary substantially according to the different trek routes. Snowman Trek – is said to be the hardest trek in the world, with 12 passes between 4500 and 5300 meters, overnight stays at between 3700 und 5100 meters, 24 days, the majority in unsettled, high alpine areas. Jomolhari Trek, Rodung La Trek – Routes in the high mountains, requiring some endurance, 6 to 10 days depending on the chosen route, partly in unsettled areas. Druk Path, Dagala Trek, Gasa/Laya Trek – shorter treks with remarkable altitude differences, 3 – 6 days. Bumthang Culture Trek, Gangtey Trek, Samteygang Trek, Nabji-Korphu Community based Nature Trek – simple routes from village to village, 3 – 4 days. Bhutan offers all different levels of trekking that will suit your taste and physical fitness. 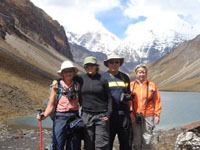 To choose the right trek, see the detailed descriptions of each trek. Trekking in Bhutan involves walking along routes passing by 7000 metre high mountains. Such peaks are permanently covered in snow and remain unclimbed even today. Mountaineering is forbidden in Bhutan due to the Buddhist belief that all mountains are representations of holy deities and should therefore not be exposed to the disruption of mountain expeditions. In Bhutan, all trekking supplies – camping equipment, kitchen implements, food – are all carried on animal back (ponies). Porters are rather unusual in Bhutan with loads usually carted by horses or, in higher regions, yaks. All trekkers are accompanied by a guide, a cook and usually at least one horseman or yak herder. With the surest footing; they lead trekking groups across the passes. The horseman and cook will usually run ahead during a trekking day. They will have prepared a packed lunch for hikers and will go on to the night’s resting place to set up camp. For walkers the most appropriate trekking times are mid-March to mid-May and mid-September to the beginning of November. There are however also trekking routes that are better suited to Summer or Winter. Earlier in the year the light is sharper but the nights are very cold. In autumn, after the rainy season, the skies clear and the leaves begin to turn yellow. Between mid-June and mid-September one should expect regular rainfall. At altitudes beneath 2000 metres leaches can be a challenge. To find the possible and best times for each single trekking route please see the table of trekking routes and the detailed descriptions of each route on our website.